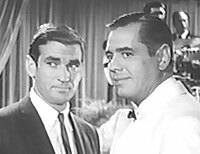 Rod Taylor was a "special guest star" in this installment of "Desilu Playhouse," an hour-long anthology series produced by Desi Arnaz and broadcast on CBS (1958-1960). "Thunder in the Night" was one of only two plays that Arnaz himself appeared in during the season. Taylor played Bob Carter, an investigator in a place where passports are a commodity -- bought, sold, stolen and counterfeited. But the crime has escalated, and a man has been killed for his passport. Carter turns to his friend, Chris Hunter (Desi Arnaz) for help and to tap his knowledge of the shadier characters around. The episode is stylish and ambitious -- with a "Casablanca" feel to it. But Rod's role is rather ordinary and all too brief. 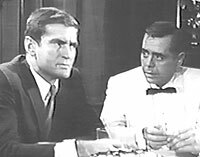 There was one major perk for Rod, as author Stephen Vagg noted in "Rod Taylor: An Aussie in Hollywood": It was filmed in Italy. During the Italian stopover, Rod met Anita Ekberg, the buxom Swedish film star ... who had recently relocated to Rome, where she was to make "La Dolce Vita." Anita and Rod hit it off and began a highly publicized romance which lasted on and off for the next few years. For more about the Taylor-Ekberg romance, visit the page for "Seven Seas to Calais."